New Ink. Rob Benavides of Flying Panther Tattoo in San Diego Rocks! Ink is done. Hurts a bit. This was a two session stint. First pass was outline and shading of the lower half. Today (or rather yesterday) was finishing up the upper half, which includes very sensitive skin. I’d have tapped out if we’d done it all in one stint. The design is meant to invoke kimono / textile flowers found in traditional Japanese art. Also in the style of hanafuda cards, a game I’ve played since I could count pennies…and taught others how to play. It’s an addiction. I need more people to learn it. But learn the Hawai’i style because it’s easier on the brain. 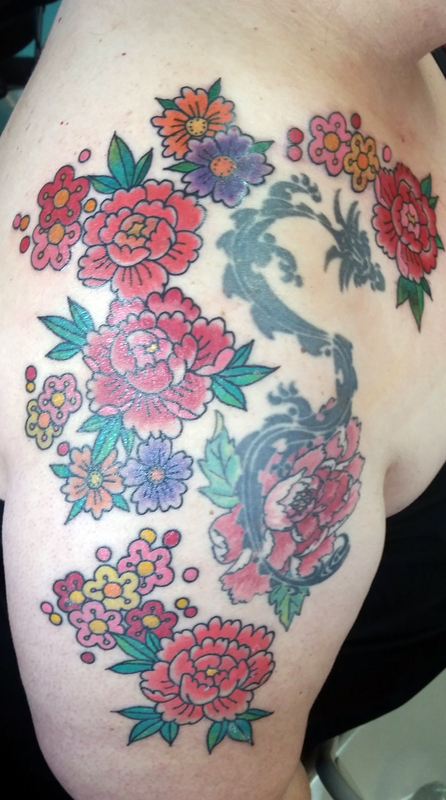 The dragon and other flower are much older and the inks have changed so dramatically since that time. We’re talking more than a decade-and-a-half or thereabouts. This was done at Flying Panther Tattoo by Rob Benavides who is a master of tattooing and a really awesome guy. Those of you who read the Kai Gracen series might recognize the Flying Panther name. I gave them a shout out in Book One. Now, I need a nap. And maybe some pizza. Tramps and Thieves (Rook/Dante #2) Will be out on Sept 18th! FAPA President’s Book Awards! Gold for Ink and Shadows, Silver for Hanging the Stars! Beautiful!! You are extremely brave. Complex, bright. I love it and how Rob merged the old and new ink. We’ll go back and retouch the old when I come back. Lovely, I love the colours, and you put thought into the design. Very nicely done. 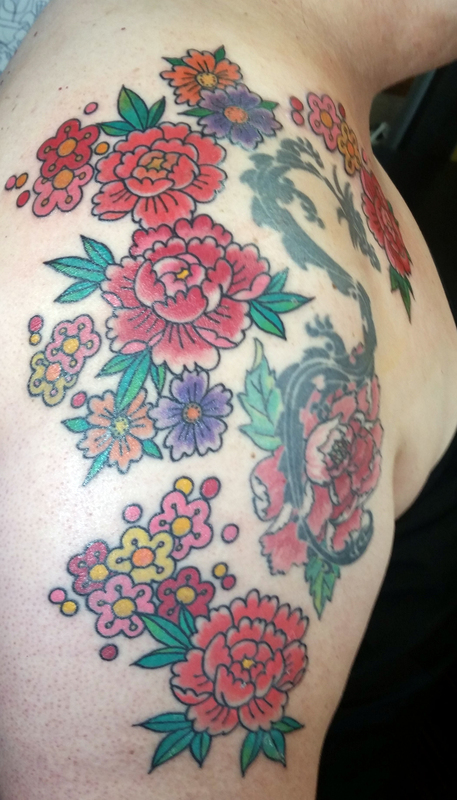 I want to get flowers across the back of my shoulder but not decided on design yet – LOL only just got my ankles done a few weeks ago – I’m not at all brave.